Do you like nature, wildlife and looking after your local area? Do you want to get out more and make new friends? Or do you just need a breathing space? Come and join the group at Witton Dene. No previous conservation experience necessary There’s always something to do and people to chat to. Come weather prepared. The Men’s shed is a project which works in partnership with Changing Lives at Plawsworth, Free the Way and Durham County Council. The Men’s shed has been supported financially through Durham County Council’s Cree project which promotes positive activities for Men, particularly those most vulnerable . 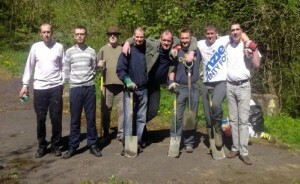 Men join us here at Breathing Space where they help out with conservation activities in Witton Dene. The men are greeted with refreshments before joining in the conservation activities which Dave Tully arranges for the group. Dave comes to us from Woodwise a local community and environmental educational project and has a background in conservation work. The group is recognized by the Friends of Witton Dene and Denis Daggett (the chairman) is a regular volunteer liaising with Breathing Space to ensure that the work done in the Dene is what is required. Local wardens from Durham County Council Countryside team are also involved in supporting the programme with equipment & materials. The men also have the opportunity to have a little quiet time in the church for prayer , rest and reflection.